Mourvèdre is the workhorse of the vineyard. It is added to Rhône blends to bring an earthy note or to create a backbone of tannin. 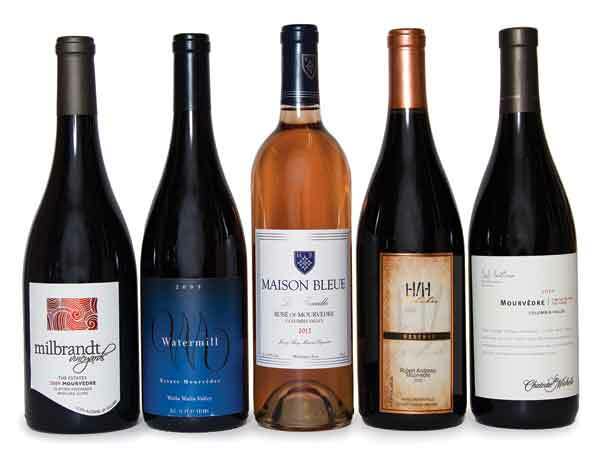 When Mourvèdre is used in rosés for its minerality and lack of full fruit, these superlight pink, sometimes pale orange wines are stony with light fruit of rhubarb and peach. The red wines made from Mourvèdre tend to be tannic, higher in alcohol and have gamey or earthy notes. Although we do highlight Mourvèdre from the Horse Heaven Hills (see page 93) because it grows particularly well there, we wanted to spotlight this often unsung grape in a variety of AVAs. Each wine had to contain 75 percent or more to be labeled Mourvèdre, giving us a chance to experience this interesting wine from a broad range of growing regions. This was an “open submission” tasting (details below). Read Seattle magazine's Eighth Annual Washington Wine Awards story here. Read about the Best Wines of Washington's Winegrowing Regions.